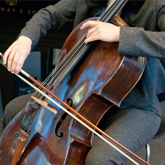 Music and Museum featuring the Bechtler Ensemble is BACK! Experience a fusion of sight and sound while gaining a new perspective on selected musical and visual artworks. This innovated classical music concert series is performed by the Bechtler Ensemble under the leadership of Tanja Bechtler. Concerts are performed in our fourth-floor gallery space to provide the audience with an intimate setting to experience the soothing sounds of classical music which are usually about one hour in length. Musical compositions are generally chosen from the same time period as the artwork and a brief explanation is given as to why the composer and artist were paired. This multi-disciplinary approach greatly enhances the experience of the audience. Patrons have described these concerts as: “exciting,” “de-stressing,” and “fun and ‘informative”. Tanja, who is the granddaughter of Hans and Bessie Bechtler, adds colorful anecdotes about growing up amidst a house full of art. May 5 at 6 p.m. Sponsorship for the Music and Museum: Bechtler Ensemble Series is provided by Natasha Bechtler, George and Peg Povinelli and Donald Sohn.